Jane Silberstein has 20 plus years experience in community and organizational development. Her professional background includes community visioning, eco-municipality advancement, comprehensive plan and local coastal program development; waterfront, downtown, bikeway, open space/environmental and neighborhood plans; ordinance and policy development, growth management, environmental review, and economic improvement/diversification plans. Silberstein specializes in writing about the principles and concepts of sustainable community development. 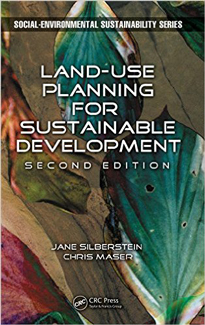 With Chris Maser she co-authored Land Use Planning for Sustainable Development (2000, 2nd edt. 2013). She is also one of the co-authors of Toward Sustainable Community: A Toolkit for Local Government (2007). Silberstein moved to Bainbridge Island in 2007 to teach at the Bainbridge Graduate Institute. Now retired, she continues to engage at the municipal level on Bainbridge in issues pertaining primarily to land use.